You see where I’m going with this, don’t you? Donald Trump builds buildings, not walls, so this is ideal for him: 2,000 miles of mid-rises and high-rises that form the border with Mexico. 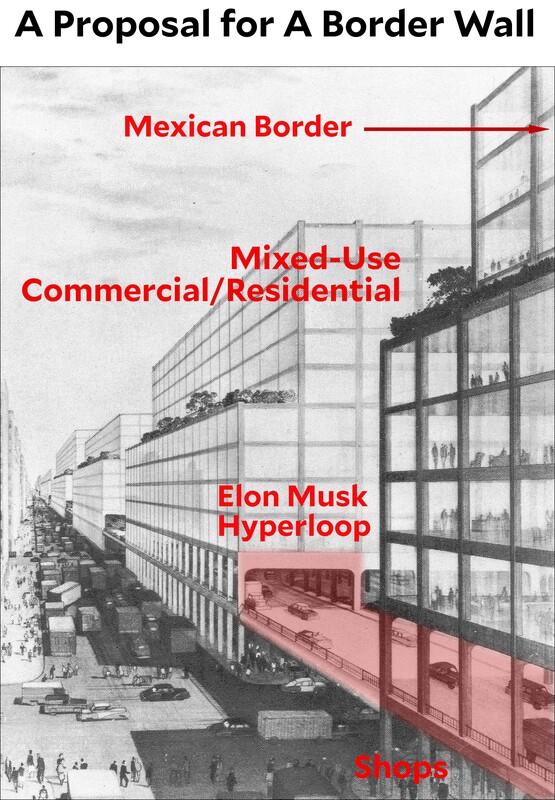 The building complex becomes a walkable city all by itself, and the hyperloop means you’re never more than a few minutes from a port-of-entry and the city surrounding it. The south-facing windows, of course, would be bulletproof, and the bottom 30 feet would be steel fencing. I figure it would cost $20-30 billion tops, and it could be finished in time for the 2020 election. So what do you think? Let’s hear your honest opinions.